The Ringed Salamander is found in the Ozark Plateau and Ouachita Mountains of Arkansas, Missouri, and Oklahoma. Like most salamanders of the family Ambystomatidae, they are fossorial, spending most of their time hidden under ground, leaves, or logs. Hence why the family is often called the mole salamanders. The best time to see the Ringed Salamander is fall from September to November, when they come out to breed. October is the best month to see them since that is when they are the most active breeding. Hundreds of individuals come to shallow, fish-less ponds to avoid any predators. Fertilization occurs internally. A day or two later, the females between 5 and 40 eggs on the bottom of the pond. Eggs hatch anywhere from 9 to 16 days after being laid. 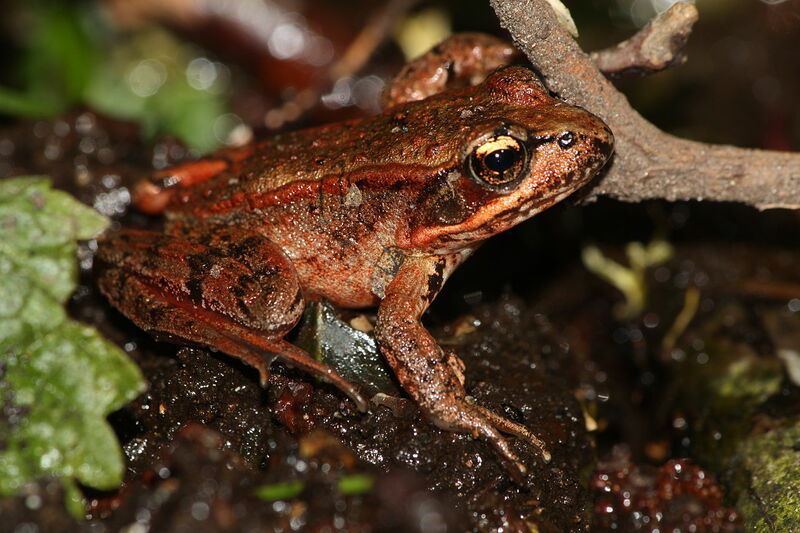 The Northern Red-legged Frog is found along the western coast of North America. They breed from January to March depending on how far north they are located. Farther north they are, the later they breed. Egg masses from the frogs number between 300 and 5000 eggs. Eggs hatch in about a week into tadpoles. The tadpoles take 3 to 7 months to fully undergo metamorphosis. Some of the tadpoles take until the next spring to turn into frogs. Adult frogs can live up to 10 years. The Apennine Yellow-bellied Toad is a diurnal (active during the day) species of toad, which is kinda unusual for most frogs and toads. It probably has to do with the fact that the Apennine Yellow-bellied Toad needs to show off its bright, yellow belly to warn predators that they are toxic. It would be hard to see if its dark out. Other frogs and toads want to stay hidden during the day to avoid predators. When threatened by a predator, the Apennine Yellow-bellied Toad arch their back to show off their belly. This is called the unken reflex. The Apennine Yellow-bellied Toad hibernates from November to late April. I wish I could hibernate during that time too. After waking up, the toads get to work to start breeding. They breed from May all the way to September. Mating takes place in temporary bodies of water. Females lay a couple eggs to a couple dozen of eggs. Populations of the Apennine Yellow-bellied Toad have been decreasing. It is thought that Chytrid Fungus is one of the culprits behind the drops. Chytrid Fungus is a deadly disease affecting amphibians around the globe. The Apennine Yellow-bellied Toad was the first Italian species of amphibian to be confirmed to have Chytrid Fungus. Another reason for the declines include habitat loss due to farming. The Gaboon Caecilian is an amphibian, not a snake, worm, or eel. Caecilians are adept at underground life and have characteristics that reflect that. They don’t have legs to help them move easier through the tunnels underground. They have poor eye sight because they don’t need to see well in the darkness of the underground world. The Gaboon Caecilian is a viviparous species of caecilian, which means they give live birth to live young. They can give birth to up to four baby caecilians that can reach lengths of 3 inches. Water is not needed for breeding for caecilians. The Mexican Spadefoot Toad is found in the southwestern United States and most of central Mexico. Like all spadefoot toads, the Mexican Spadefoot Toad does have keratinized spade-like projections on their hind legs. They use these spades to burrow into the ground. The Mexican Spadefoot Toad spends most of the day underground, coming up at night to hunt and look for mates. For mating, it usually takes place after heavy rains. Breeding periods only last one or two days in ponds and pools that form from the rains. These pools and ponds only last a few weeks. Therefore, the eggs hatch in a few days and it only takes the tadpoles a couple weeks to undergo metamorphosis. The Fiji Ground Frog is found only on the islands of Fiji. It is found on the four larger islands (Taveuni, Vanua Levu, Ovalau, and Gau) and on the smaller island of Viwa. Sadly, the frog hasn’t been doing to well. The islands of Fiji have been hit hard by invasive species. The Javan Mongoose / Small Indian Mongoose (Herpestes javanicus) and the Brown Indian Mongoose (Herpestes fuscus) have been introduced to the island and have found that the Fiji Ground Frog is delicious. These mongooses have wiped out the frog from other islands of Fiji. Other invasive species such as cats and Cane Toads also aren’t helping. Neither is deforestation of their habitat. Have you heard of Romeo, the world’s loneliest frog? Romeo is a Sehuencas Water Frog (Telmatobius yuracare), an aquatic frog species only found in Bolivia,and was thought to be the last of his species. He has been alone in the Museo de Historia Natural Alcide d’Orbigny in Bolivia for 10 years. Romeo’s home habitat has been lost and damaged due to agriculture and logging. Water pollution, Chytrid fungus, a deadly disease for frogs, and invasive trouts all don’t help the frogs either. The future is not looking great for the Sehuencas Water Frogs. Scientists with the help of the Global Wildlife Conservation and the Museo de Historia Natural Alcide d’Orbigny, set up a Match.com profile page for Romeo to help raise funds to find him a lover. On Tuesday, Teresa Camacho Badani, the chief Herpetology of the Museum, announced that they have found Romeo his Juliet. Besides just finding a Juliet, they found four other frogs, including another female. The new frogs are currently in quarantine so that they get used to their new habitat and to insure that they are disease free. They plan to introduce Romeo and Juliet on Valentine’s Day and hopefully, they will start breeding. The scientists hope to help re-establish populations of the Sehuencas Water Frog with a captive breeding program. The Woodhouse’s Toad is found in the western United States and down barely into Mexico. It is named after Samuel Washington Woodhouse, a physician and naturalist. There are three different sub species of Woodhouse’s Toad that some scientists recognize. The Taylor’s Salamander is a neotenic salamander, found only in Laguna Alchichica, a crater lack, in Puebla, Mexico. The lake has very high salinity, at levels that would kill any other salamander species, but not the Taylor’s Salamander. It is somehow able to tolerate it. The Taylor’s Salamander faces difficulties in the lake. The water from the lake is being extracted for irrigation and drinking. The levels of the water is decreasing and the quality of the water is decreasing.